Northern Ireland's Chris Brunt will miss this summer's Euro 2016 finals in France after having knee surgery. The 31-year-old West Brom defender is expected to be out of action for six months after damaging his anterior cruciate ligament. 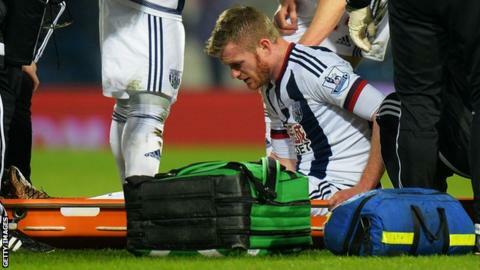 Brunt, capped 54 times, was injured during the Baggies' 3-2 Premier League win over Crystal Palace at the weekend. The left-back played eight times for Northern Ireland during the Euro 2016 qualifying campaign. "It's a big blow for Chris and everyone is feeling for him right now," said West Brom head coach Tony Pulis. "It will be disappointing for us not to have him for the rest of the season because he is a terrific player who gives the team great balance. "But obviously it is made even more cruel because it has denied him a career highlight with Northern Ireland this summer." Brunt was accompanied by Albion's director of performance Dr Mark Gillett when he flew to France for surgery on Thursday. "We are hopeful Chris will be nearing the completion of his rehabilitation towards the start of next season," he said. Brunt made his Northern Ireland debut against Switzerland in 2004 and was regularly deployed on the left wing, but more recently reverted to a full-back role. The team are preparing for their first appearance at a major finals since 1986. Northern Ireland have been drawn in Group C, alongside Ukraine, Poland and world champions Germany. Their first match is against Poland in Nice on Sunday, 12 June. "It's a devastating blow for Chris. To play as long as he has at international level and now to miss out on the finals is heartbreaking," said Northern Ireland manager Michael O'Neill. "All we can do is sympathise with him and support him at this time."